Last year we hosted an expert webinar where we talked about the about the importance of consistency in your posting schedule. Whether you decide to post every day, once a week or twice a month (or anywhere in between) – a clear and decisive plan of what you are going to post will help keep you on track. 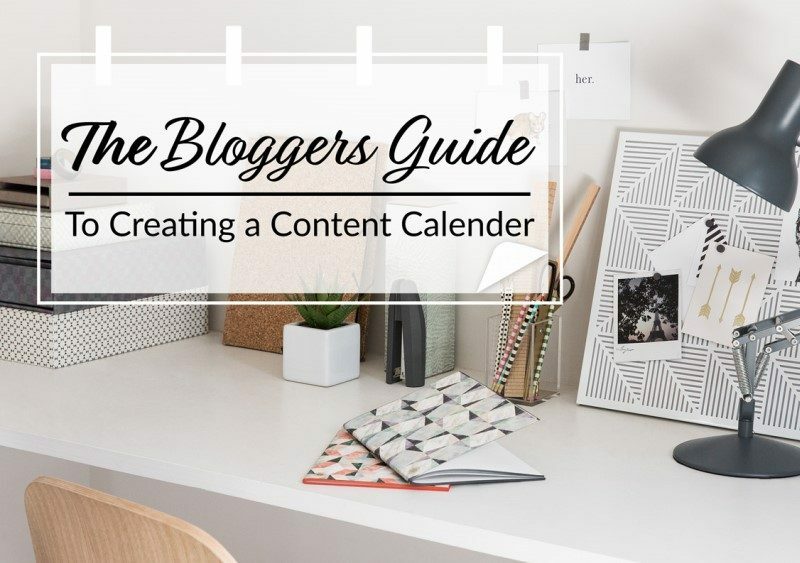 A content calendar is a blogger’s dream, rather than scrabbling around for topic ideas that may have you panicking or producing content of lower quality, you have a clear plan of articles lined up for weeks or months in advance. In this quick guide, we’ll show you one way to set up a content calendar that is easy to use, and also easy to personalise for how you want to work. Firstly, you need to go get yourself a Trello account. Don’t worry, it’s completely free for what we are going to be using it for. Next up, read & watch this post for beginners tips on using Trello. It will give a fuller understanding of the tool that we’ll use for creating our very own content calendar. 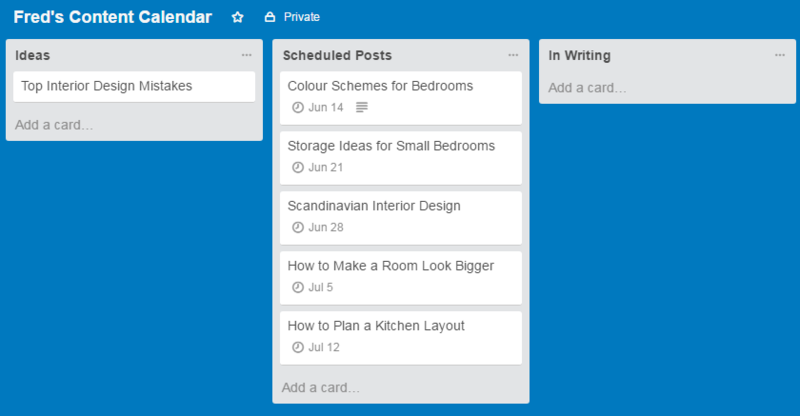 Now you’re well on your way to becoming a power-user of Trello, let’s create your content calendar board. The Trello Board is your Content Calendar. 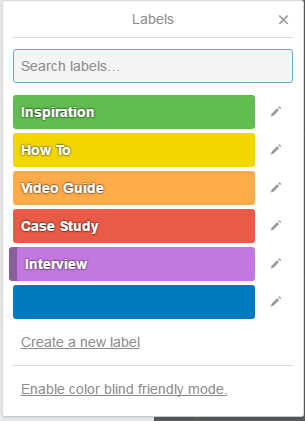 A Trello Card will represent a blog post and each Trello List will represent the different stages of the blog post. Ideas – This is where you will store all your ideas you sporadically come up with or during brainstorming sessions. Scheduled Posts – This list will host your definite articles you will be publishing on the given date you have chosen. In Writing – When you are working on an article you’ll place it in here. Live – Once posts are live you move them here ready for promotion. Promoted – When your blog post is completely promoted-out this is the final resting place for the blog post. Now add all your ideas that you have saved somewhere, on scraps of paper in the draw, on the pin board, wherever you currently keep them. Alternatively just have a little brainstorm to get things moving, add some blog post ideas that you want to write about each with their own card. If you already have a posting schedule in mind you can now start to plan the next few weeks or months of your content. For the purposes of this example, my posting schedule will be publishing one blog post per week (on Wednesdays). This gives plenty of time to create more content as well as even more time to promote the content and get more visitors to my blog. 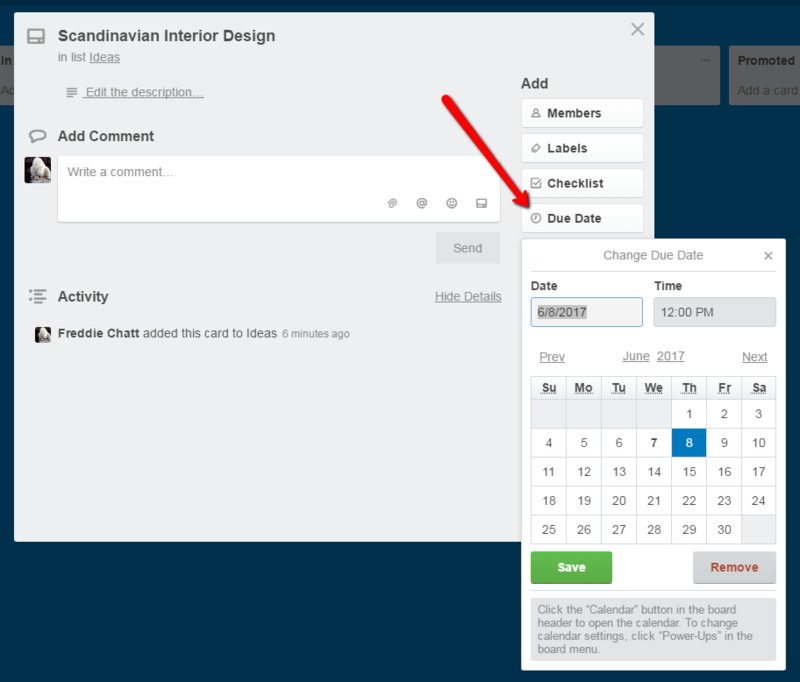 You can add due dates to the Trello cards which will act as your publishing dates – this gives you a clear deadline for getting the blog post finished by. Once you’ve selected your next batch of blog posts, move them over to the scheduled list so you don’t get too distracted by the rest of the blog post ideas. A great feature of Trello is the ability to add checklists to the cards. We’ve spoken about checklists in the past – and they can be incredibly useful at making you feel good and making progress when writing a blog. 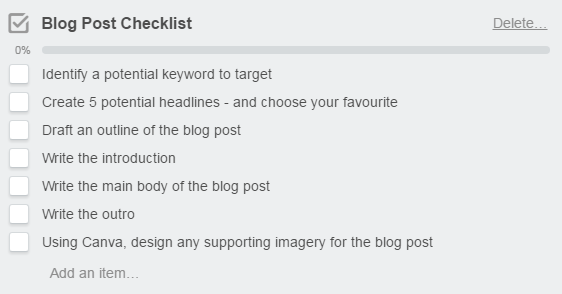 Here is a very basic example of different steps you could include in your blog post checklist. You can also include multiple checklists on your Trello cards – so you could create a ‘Pre-Launch Checklist’ and ‘Post-Launch Promotion Checklist’ and copy them across to all of your blog post Trello cards to make sure you never forget anything. Now you are ready to start writing your first blog post – to help keep your focus on that article only move it into the ‘In Writing’ list. Once you have finished writing, uploaded the article to your blogging platform, added any imagery or social mark up to your posts to make them really stand out – you move the card over to ‘Scheduled’. Now depending on your time, you can either choose to start writing another article (and move that over to ‘In Writing’ as you do) or start planning your promotion of your scheduled blog post. Once your blog post is live it’s time to work through your Promotion Checklist to get your blog post out there and all those visitors to your blog. Then the process is essentially a cycle to make it possible for you to keep on top of all your blog posts and keep everything in one place. Trello offers an array of extras that we haven’t touched upon yet – there are plenty of guides out there to become a pro user but we have kept things ultra-simple so far, so you can spend more time actually writing. But here are a few pro tips that you can make use of straight away. Calendar Plugin – To get a calendar view of your Content Calendar (which some people find easier to view) enable the Calendar Power-Up and you can switch to that view. This makes it a lot easier to move your blog posts around in a schedule. Using More Than One Board – We’ve kept everything super-simple on this guide to make it accessible for everyone. Whilst to get full use of the calendar plugin all your scheduled posts need to be on a single board, if you’re ‘Ideas’ list gets too much to handle on that board (or too distracting) then you can create a separate ‘Ideas’ board to be able to split them up or categorise them in certain ways. Use Labels – If you have different categories on your blog and want to make sure you fill them all up, or however you like to categorise your posts. Labels are a fantastic way of making sure you are splitting your content evenly across your main categories to cater for your entire audience. Add keyword volume to the Trello card – If you are starting to consider SEO more within your articles, you can include the keyword volume in the Trello Card name so you can prioritise articles that have more potential for traffic. Make it Your Own – The great thing about Trello is you can change the lists to suit your needs. For example; if you have a friend who proofreads and edits your posts you can add a column for that or if you want to condense the columns you can or add more things into your checklists at any time. You can customise the background to make using Trello that little bit better and inspirational too!